Here is one more great reason to make Hughes Air Heating & Cooling your water heater service of choice: We offer cost-effective maintenance agreements along with one-year warranties on water heater installation. Learn more when you call to talk with one of our water heater repair pros. Your indoor comfort is our utmost concern! Having hot water on demand is one of the greatest pleasures of indoor plumbing. When you’re experiencing water heater problems, Hughes Air Heating & Cooling is trained and equipped to help. From a water heater leaking all over the floor to a unit that’s unable to produce enough hot water, we can make swift work of the required repairs. Our water heater service runs the gamut from routine and emergency repairs to replacement, installation, and professional maintenance. In the Mesa area, we’re your all-in-one source for reliable water heater repair and water heater installation. Call now to schedule a visit from one of our skilled technicians! While water heater technology has changed in recent years, you can be sure our water heater service team has stayed current with the trends. Whether you depend on a traditional water heater or a newer tankless model, our water heater repair specialists are armed with the knowledge and tools to help. We strive to resolve water heater problems as quickly and carefully as possible at Hughes Air Heating & Cooling. We understand the inconvenience of being without hot water, so we make every effort to bring you water heater repair service that’s second to none. When your water heater is beyond repair, don’t think your case is beyond the assistance of Hughes Air Heating & Cooling. 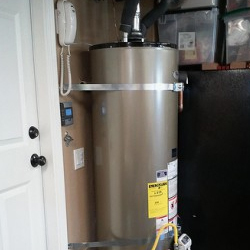 We’re not only your water heater repair company in Mesa, but we’re also your local resource for water heater replacement and water heater installation. In other words, our water heater installers cover all the bases when it comes to new or replacement units. We can see to your individual needs for gas water heater installation or electric water heater installation, whatever is preferable for your situation. We can also assist with tankless water heater installation, if you’re a good candidate for this energy-efficient option. Supplying your home or business with a state-of-the-art water heater is easier than you might think, thanks to our licensed, bonded, and insured professionals. Call us or connect with us online today.